So many heroes, so few villains; it’s almost not even fair. Even so, the Avengers are pushed to their brink in Avengers: Age of Ultron as they face off against a web-based villain and some ‘enhanced’ twins with super powers. The second movie in the Avengers franchise is exactly what fans wanted and contained enough comic book material to make the Marvel aficionados squeal with glee…for a full 141 minutes. The audience finally gets to see characters as human (so to speak) when they fall under some mystic power and come face-to-face with their fears and other dark events from their past. Later, while tinkering with some supreme power beyond their comprehension, Tony Stark (Robert Downey Jr.) and Dr. Banner (Mark Ruffalo) accidentally create artificial intelligence (named Ultron). Ultron, whose main purpose was for world protection, was somehow corrupted and starts to believe that the Avengers and people in general are what the world needs to be rid of in order to start over and eventually thrive – and you can sort of see his point here. So, in order to rid the world of its disease, his plan is exterminate it and leave it to the rubble. While the story itself is unnecessarily complex and contains pieces from all the other Marvel movies that some audience goers may have missed (or skipped), it certainly isn’t short on action. Fans of the other Marvel movies will get immense pleasure from the dizzying fight sequences, the inside jokes, and the fun that goes along with watching these heroes risk their lives for the greater good – others will just roll their eyes. Whether or not this movie is enjoyed wholeheartedly or simply brushed off as another shallow feature from the money-making machine that is Marvel will depend completely on expectations. It will be corny, it will be ridiculous, but thankfully it’s not pretending to be anything but good, mindless, fun. Unless a Marvel movie is written and directed by Christopher Nolan in the future, they are never going to be anything other than that. Avengers: Age of Ultron and its writer/director Joss Whedon have delivered what the majority of movie-goers want from a superhero movie, as evidenced by the amount of money it has made at the box office so far. 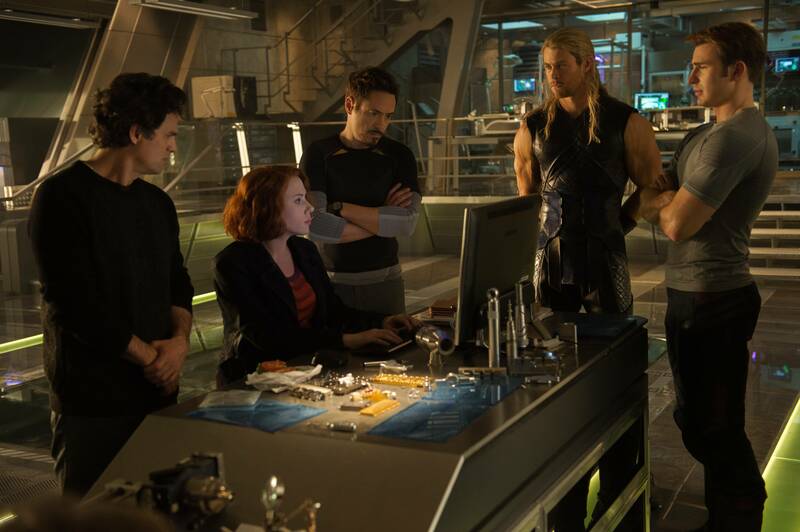 The heroes featured in the movie include: Tony Stark/Iron Man, whose quick wit and sarcasm is classic Robert Downey Jr.; Thor (Chris Hemsworth), who is subtly funny and whose hammer is the source of a few laughs; Steve Rogers/Captain America (Chris Evans), whom the others just seem to tolerate; Natasha Romanoff/Black Widow (Scarlett Johansson), whose romantic interest in Bruce Banner/The Hulk, the guy who is only useful when he’s dangerous, just seems forced; and Clint Barton/Hawkeye (Jeremy Renner), the guy who uses a bow and arrow and whose value we don’t really understand. One would think that would be enough brawn and testosterone to thwart any evil plan the universe could throw at the Earth… and one would be right. The odds are always in their favour but as with every epic hero vs. villain movie, all hope is (temporarily) lost until a last minute plan reveals itself. In the meantime, the characters have to work together to figure it out and overcome some tension developing within the group. James Spader is the voice of Ultron and those who know him well from Boston Legal and The Blacklist will be happy to know that the character, at times, has a very familiar humour that shines through his villainous, metal façade. Once again, Robert Downey Jr. and Chris Hemsworth steal the show as they play the least uptight characters in the movie and provide the majority of the laughs. There are some new faces but the majority of the characters from the other movies return for the fight against evil. Fans will surely be happy to see their old friends once again. 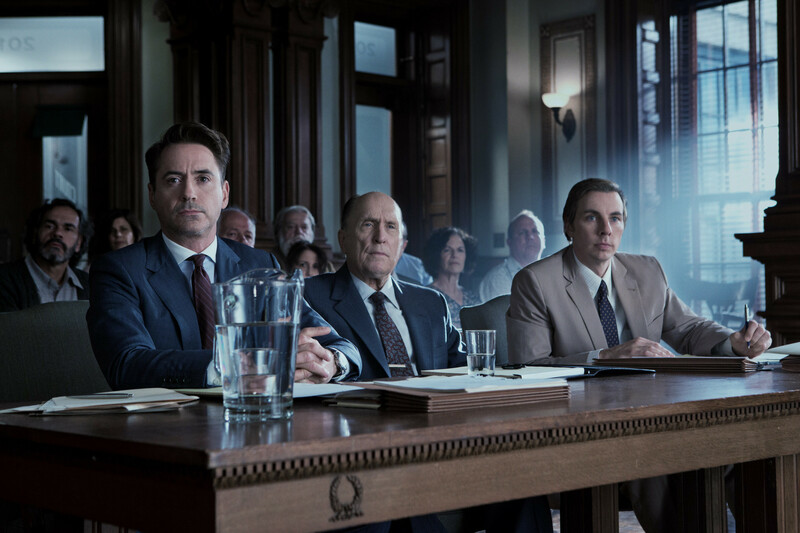 The Judge starring Robert Downey Jr. and Robert Duvall. The Judge has been labelled as a courtroom drama but most of the movie actually takes place outside of the courthouse and deals with the intense family dynamic and Hank trying to cope with his old demons rather than the trial itself. The acting is superb, with a great supporting cast that includes Vera Farmiga and Billy Bob Thornton, and there are just enough quick-witted one-liners to lighten up the mood when things get a little dark. And they definitely do. You’ll find yourself more interested in the family and how they are going to get through it, than finding out the details about the hit-and-run that started the whole thing. Watching this movie, it is hard to believe it is directed by the same person who brought audiences Wedding Crashers and The Change-Up. Upon further inspection, it appears that the screenplay was written by Nick Shenk, who also wrote Gran Torino. Suddenly things seem to make a little more sense. The Judge has a hefty runtime of 2 hours and 20 minutes which some critics have complained about, but there is enough suspense (in terms of the trial), unanswered questions (in terms of the relationships), and impending re-conciliations to retain the audience’s interest. The argument that the movie is “something we’ve all seen before” sounds like its coming from all the people who thought Avatar was “just a Pocahontas rip-off”. Sure, there is a formula (there usually is), but that doesn’t mean that the movie isn’t worth watching, because it certainly is worth it. The best advice is to stop reading reviews and just go see it for yourself. You’ll laugh, you’ll probably cry, and at the end you’ll be happy you saw it.